I really couldn't not mark the passing of the Queen of Soul. Ever since my first forays into soul music, Aretha Franklin's voice has been ever present. Even before that as my first sight of Aretha was when she was giving it tight to Matt "Guitar" Murphy" when Jake and Elwood rock up at her Soul Food Cafe trying to lure her husband back to the band. I will not lie and say that her music was on all the time but when I did put something on it always meant stopping what I was doing and just listening to that amazing voice and phrasing. Unlike many people I wasn't that impressed with the collaborations with the likes of Annie Lennox and George Michael. But in 1993 when she collaborated on A Deeper Love with Cliviles and Cole I was astonished, Aretha does house! Sure the production was as you would expect from those two but it was the vocal that immediately grabbed your attention and held it as long she was singing. 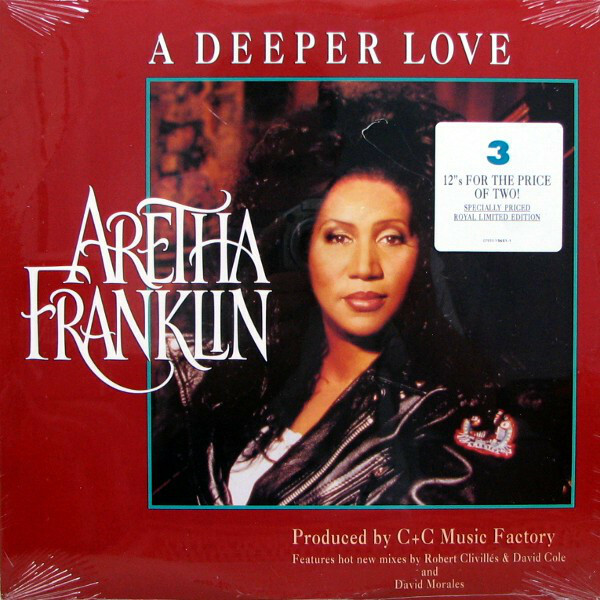 The track had been released by Cliviles and Cole the previous year featuring Deborah Cooper on vocals and if you want an illustration of how incredible Franklin's just compare and contrast the versions and Cooper's vocal is very very good but pales into insignificance next to the Queen of Soul's. Last night I dug out the triple gatefold 12" of A Deeper Love and listened to all nine of the mixes but didn't think to rip them as I was not intending to do a post today so below is the youtube of my favourite mix, the Deeper Mix. Once again I thank whoever it was that first thought of recording the human voice, as for as long as there is someway to play back recorded music people will be able to be bowled over by Aretha Franklin's voice. So let's dance in celebration of a life that touched many millions of people whether through music, civil rights or by just being a decent though complex (ain't we all) human being.